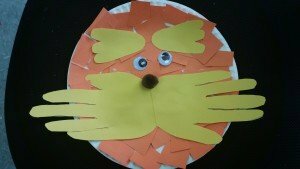 Celebrate Dr. Seuss Read Across America with this easy Lorax paper plate craft. It’s fun and easy to do and is greate for day care, pre-school and elementary school students. Follow the step-by-step directions below to create your own Lorax paper plate craft. Step 1: Cut the orange construcion paper into small squares about 1 inch in size. Depending on the children you are working with you can have the children do this themselves or you can do it for them. Step 2: Give each child a paper plate. Have the children glue the orange squares all around the plate. The entire plate should be covered with the orange squares. 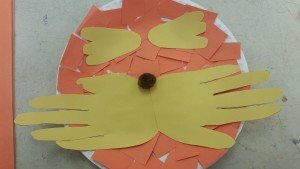 Step 3: Trace both of the children’s hands on to the yellow construction paper and cut them out. Glue them onto the plate with the fingers on both sides facing out. This will be the Lorax mustrashe. Step 4: Use the rest of the yellow construction paper to make the Lorax eyebrows. You can cut them out like on the project below (I drew little duck feet as eyebrows) or you can create your own. Have the children glue them towards the top of the plate. Step 5: Glue on the googey eyes or make your own eyes and glue on a pom-pom for the nose, you can also use a button as a nose or draw one with crayon.